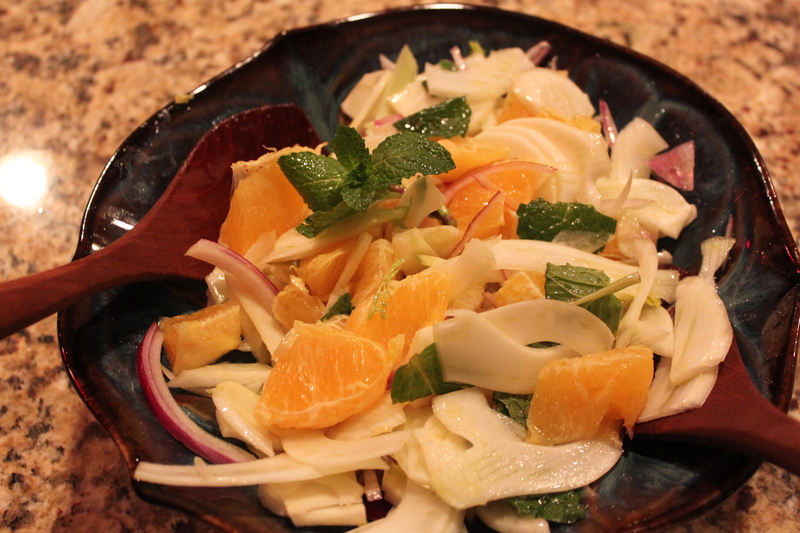 I don’t think I could survive a cold Midwestern winter without citrus. This fruit is one of God’s gifts to us to help get through the miserably cloudy, cold and windy days. Grapefruit, lemon, lime and orange = warm liquid sunshine! The fruit is used in a variety of dishes from savory to sweet. A small squeeze of lemon in a salad dressing or a generous squeeze over roasted fish and chicken brightens any dish. A cute little lemon twist in your espresso is another perfect way to enjoy the fruit. Grapefruit has been touted over the years to have dozens of health benefits from aiding in fighting arthritis, vision, respiratory problems, cholesterol etc. I like to keep it simple and think of my grapefruit as an enjoyable fruit in the morning with my yogurt and granola or mid afternoon as a snack. The sections peel easily and can be tossed with arugula, a handful of dried cherries, a drizzle of extra virgin olive oil and a sprinkle of sea salt and fresh ground black pepper easily served as a side salad at the dinner table. 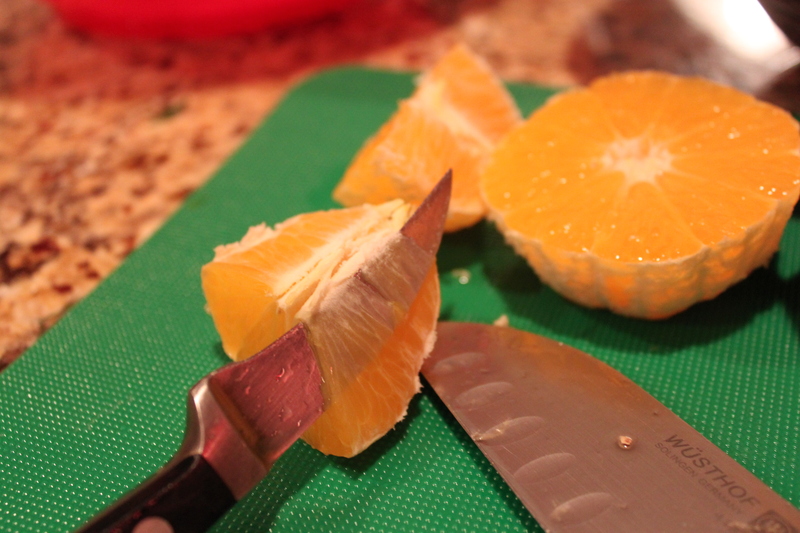 Navel oranges are my absolute favorite citrus fruit. Sweet, juicy and the colors make me so happy! My seasonal love affair with oranges typically starts in December when the days are short and the temperature drops drastically and diminishes slowly in April when the tulips bloom and the grass begins to turn green again. My father would search for the largest naval oranges during the Christmas holiday. On Christmas Eve he would lay thin horizontal slices of the orange (peel and all) flat on a platter and place an anchovy on top of each slice. A slight drizzle of olive oil and sprinkle of black pepper made our Christmas Eve “Feast Of The Seven Fishes” appetizer. The saltiness from the anchovy, sour of the rind and sweet of the orange combines to make one fabulous explosion of flavor that wakes up the taste buds in your entire mouth! 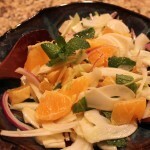 One of my favorite uses of citrus is in the Sicilian Fennel and Orange Salad. It is a light refreshing salad that brings summer directly to the table; perfect compliment to roasted pork, beef or chicken. I make this many times throughout the winter and it keeps in the refrigerator for a great salad to pack for lunch the next day. The measurements in this recipe are approximate so don’t worry about the “size” of the fennel bulb and the size of the oranges. The flavor is great; the colors are beautiful and have some fun bringing sunshine to the table! A lot of recipes ask for you to cut between orange membranes to release segments. This, to me, is not fun and brings the task of making the salad from easy to time consuming. Take a look at my pictures, which show an easier quicker process with essentially the same result. The most important thing to remember when making this salad is to work with a sharp knife and slice the fennel and red onion as thin as possible. 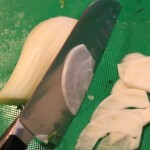 Keep in mind a little red onion goes a long way so if ¼ cup seems too much then feel free to back off on the measurement. Enjoy! Cut the peel and pith from the oranges. Cut in half horizontally and run sharp knife through the top of the membrane (no need to release the orange segment from the membrane). Place orange segments in serving bowl. 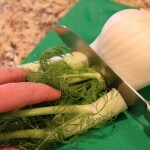 Slice the stalks off the top of the fennel bulb. 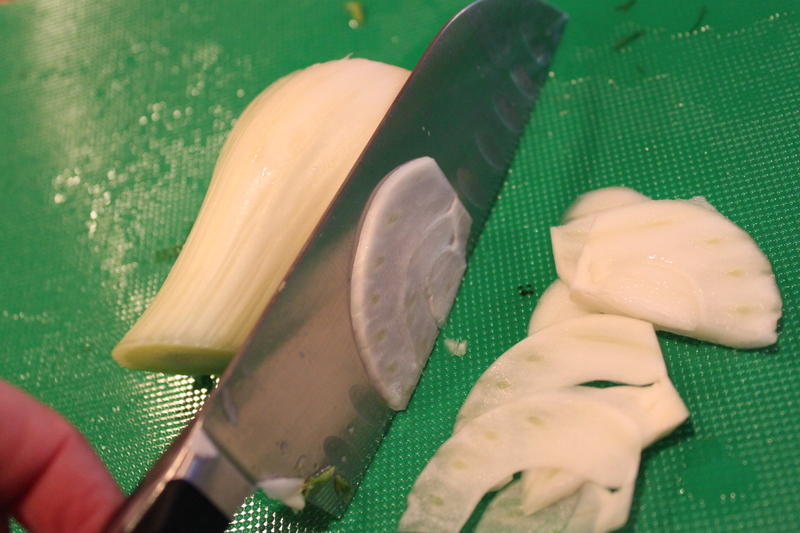 Halve lengthwise, core and thinly slice crosswise. 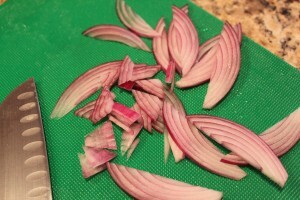 Add to serving bowl; add thinly sliced red onion. Tear mint leaves in half by hand and add to bowl. Add olives at this time if using. 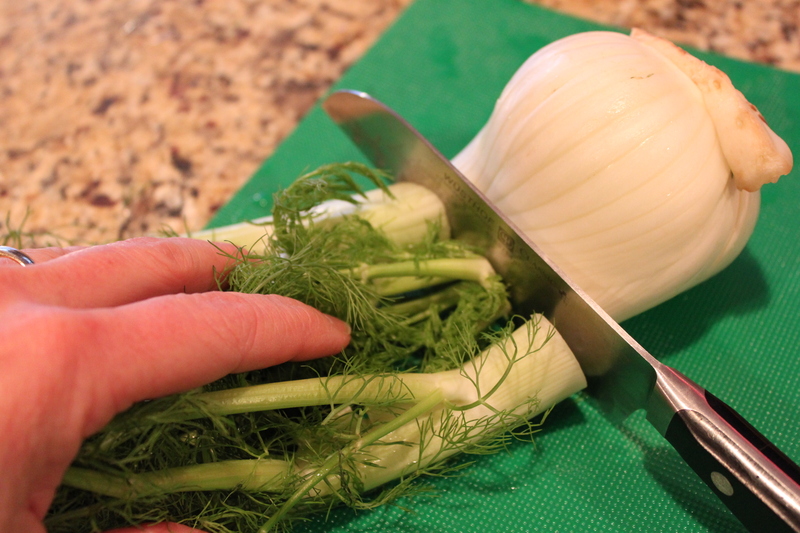 Drizzle and toss with just enough olive oil to coat fennel; season generously with sea salt and freshly ground pepper. Serve! That looks really great! Reminds me of a Thai papaya salad I once had.